Facebook has been putting bigger emphasis on Groups of late, even altering their overall mission statement to reflect as much. And there's good reason for this - Facebook Groups now have more than a billion monthly active users, which is more than Instagram and Snapchat combined. And according to Facebook more than 100 million people are members of what they call "very meaningful" groups. "These are groups that upon joining, quickly become the most important part of our social network experience and an important part of our physical support structure. For example, many new parents tell us that joining a parenting group after having a child fits this purpose." As such, Facebook sees groups as an opportunity for the platform to boost engagement and interaction, making The Social Network an even more important part of our interactive process. And there's a growing range of opportunities for brands in this evolution. You need to tread carefully - you can't just rush in spamming everyone and everything, everywhere you can, hoping for a good result - but there are ways to utilize Facebook's renewed Groups focus to further your reach and resonance on the world's biggest social network. Here are some key updates and tips to keep in mind. One of the biggest recent updates from a marketing perspective is the ability for Pages to post in Groups as a Page. In the past, only individual members were able to post in Groups, but now, you can be logged on as a Page and can comment and interact within a group setting as a direct representative of your business. The benefit of this is that you can now provide advice, assistance and technical support from your official brand account, which lends more weight to your advice (as it's coming from the actual business) while also serving as a brand building process in itself. Again, as noted, you can't just jump into every related group and conversation pitching your products and services, but you can offer assistance where possible, which can be a great way to boost your business. On top of this, you can also create your own branded Groups, then interact as your Page within them - so you could have an official group for your business where people can share FAQs and personal usage experiences, etc., and you can weigh into any relevant conversation with the official word from your business, or official updates and such. This capacity offers more potential than many realize - it does take more work, and not every business will be able to build a thriving brand community group, but there is opportunity there for those businesses that are seeing significant discussion about their offerings. Further enhancing the capacity to optimize your Group efforts, Facebook also recently launched Group analytics, which provides a range of key data points to help group admins get a better understanding of their audience, and how to maximize response. As you can see from the video, you can get stats on members and engagement, and also on the days and times when people are most active within your group, enabling you to better plan and schedule your content (another recent Groups addition) to maximize response. There's also demographic breakdowns, which can not only help you get a better understanding of your core, engaged target audience within your group, but can also improve your wider market research efforts. But you don't have to limit your use of these new features to your own groups - given the value of such data, you may be able to form partnerships with relevant, established groups to gain additional insight into your target market. 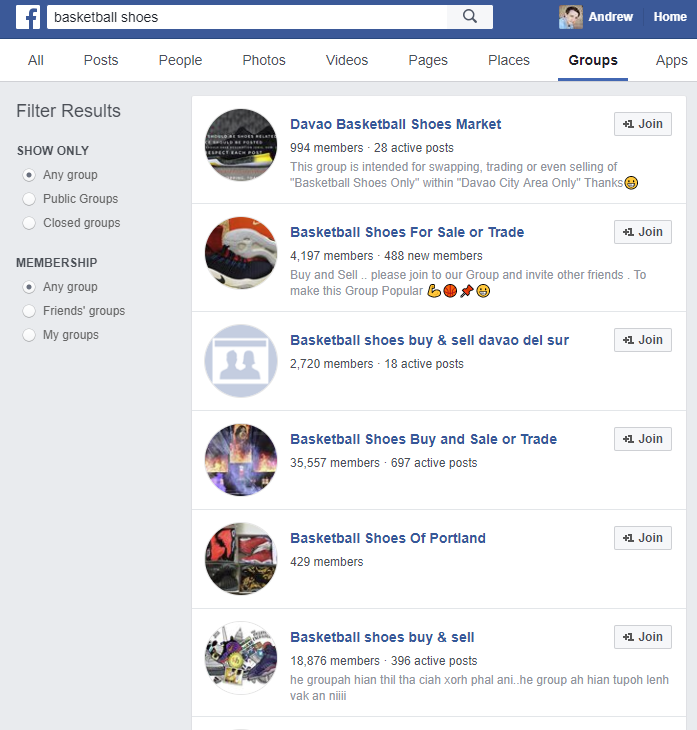 For example, let's say you sell basketball shoes - you might do a search on Facebook for the most engaged groups around 'basketball shoes' or 'sneakers', narrowing your search to groups specifically and using variations of relevant keywords. Find the groups with the most members and maybe there's a way you can reach out to them and get them to share their insights into the most popular conversations within their groups, their key demographics, popular days, etc. Such insight could form a key analytical element as you go about developing your wider Facebook strategy - and could also become a key strategic partnership to help boost your business. As you're no doubt well aware, Facebook updates its News Feed algorithm all the time. Like, all the time - there are constantly tweaks and tests in play to see how they can boost user engagement, and one of the most common reasons behind such shifts is Facebook's latest focus. Video, for example, is where they're seeing engagement, and where they want to be heading, so videos currently get more reach. The same is likely true of Groups at the moment. Kevin Roose, a journalist for The New York Times, recently joined more than 100 private Facebook groups to get a better understanding of the popularity and utility of such communities - and whether they may also be playing into the ongoing debate around Facebook echo-chambers. "As I joined groups, I noticed that my Facebook feed showed more updates from those groups, and fewer posts from my friends and the news pages I follow, a hint that Facebook may be privileging group-based content in the newsfeed algorithm that determines what users see." There's nothing official on this, Facebook doesn't release in-depth explanations of the specific inner-workings of the News Feed. But given the broader Groups focus, it makes sense - and as such, Groups may be another way to generate more reach and engagement with your brand on The Social Network, if you're able to join and participate in the right groups, or create a popular, relevant group for your business. As you can see, there's a range of ways in which you could consider using Groups within your wider Facebook marketing process - and given the platform reaches two billion monthly active users, and organic reach is constantly reducing for most Pages, Groups may be an option well worth considering. It takes extra time and effort, but given the emphasis, it could pay off.